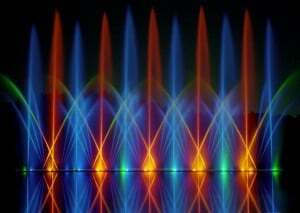 To order your own bespoke water fountain show with lights and music, contact the specialist team here at Liquid Fireworks. We have been manufacturing and installing dancing water displays for over the 70 years so you can be sure of the highest quality service. Both graceful and exciting, our fountains are perfect for bringing in crowds to a business or adding a spectacular feature to residential properties. They are so versatile as we can install them on any scale and they are designed to be seen clearly indoors or outdoors in any weather, day or night. Whether you are looking to charge admission to a commercial event that will generate revenue for your organisation, or inviting friends and family over to enjoy a mesmerising show in the grounds of your own home, we have the solution for you. There is a wide variety of captivating routines and different colours to choose from; any colours you select will be up to four times brighter than a regular fountain! Water, light and music shows by Liquid Fireworks have proven to be a very popular attraction for Seaworld, Disney and Universal Studios. With our system there is minimal maintenance required, running costs are kept low and clients can enjoy their display for months at time between services. It is always a delight to see one of our displays utterly transform a venue and captivate an audience. Our fountains move perfectly in sync with music and we are proud to have set the world standard for water, light and music spectaculars. We are committed to excellence and we are the world’s only manufacturer dedicated exclusively to the development and construction of water fountain shows with lights and music.